This recipe makes a lot of hors d’oeuvres, but can be scaled down. The marinated meat can also be divided into smaller portions and then frozen for future use. In a large bowl, mix together the soy sauce, sugar, honey, sesame oil, mirin or Shaoxing rice wine, black pepper, a pinch or two of salt, and garlic, until the sugar dissolves. Then add the thinly sliced beef or pork, a few pieces at a time, tossing gently until all pieces of meat are well coated with the marinade. Marinate the beef overnight in the refrigerator and stir every few hours. You could also transfer the meat and marinade to a large plastic Ziploc bag. If you wanted to make these well in advance for an event, you could freeze it after it has fully marinated. Simply defrost in the refrigerator and then cook as per the following directions. If desired, you could save the leftover marinade, bring it to a boil in a small sauce pot, simmer until it reduces and thickens, and then brush it onto the cooked pieces of meat. When ready, cook on a hot BBQ or grill or cast iron pan, flipping once, until just cooked through. The meat cooks very quickly and it should be nicely browned. Do not overcook the meat. 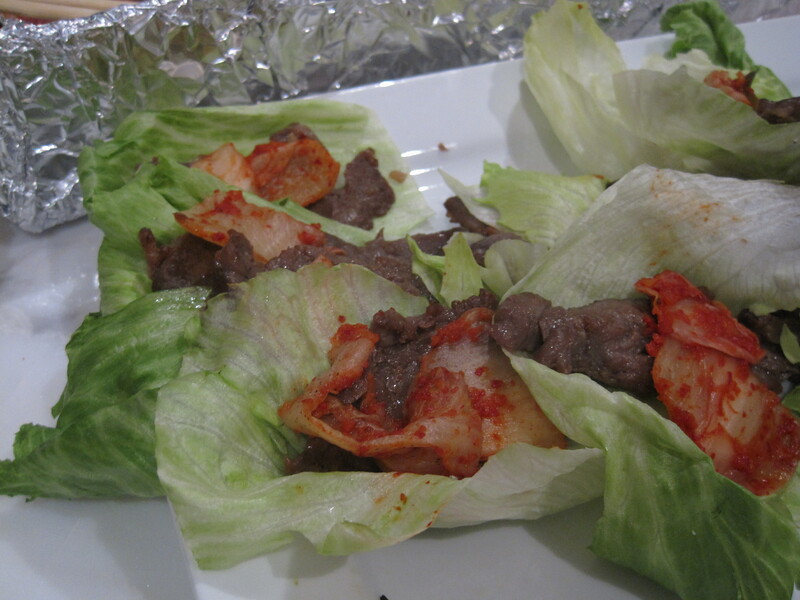 To assemble the lettuce wraps, place one or two slices of beef down the centre of a lettuce cup, top with a piece of kimchi, and then garnish with a light sprinkle of toasted sesame seeds and thinly sliced green onions (if using). Serve warm or at room temperature. If desired, serve with hot, white sticky rice on the side. Alternatively, you could place all of the components separately and allow your guests to assemble their own lettuce wraps. I was excited to see that you had gluten free asian recipes but I must let you know that soy sauce and shaoxing wine contain wheat and are not considered gluten free unless specifically indicated. I’ve had severe reactions when I thought it was ok to have regular soy sauce.